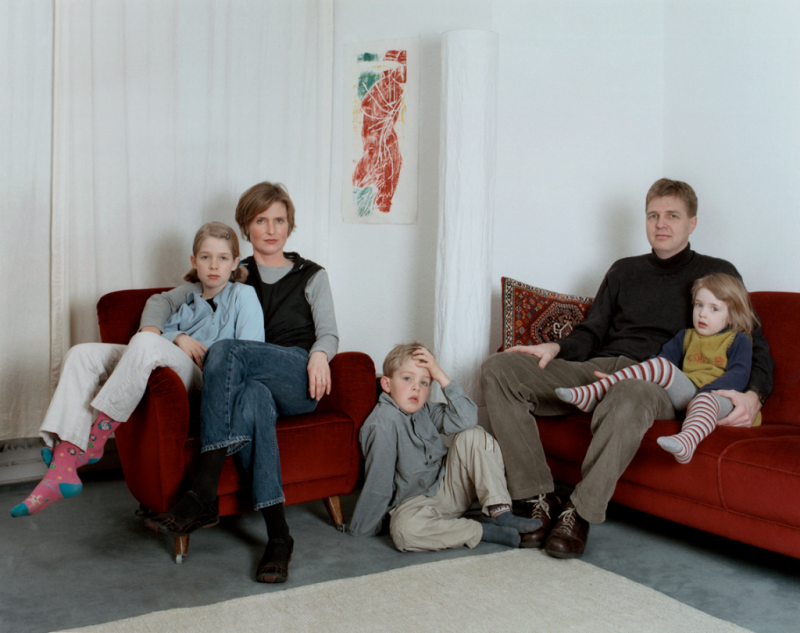 The picture shown in the exhibition is part of the series “Familienbild” (Family Picture). Within five years I portrayed around eighty families, which were selected under the following aspects: 1. One adult in the family should be about my age; 2. There should be at least one parent and one child on the picture; 3. The picture should be taken in their home. My ambition was not to create a complete sociological stock of the German family today. Neither did I want to confirm any assumptions nor show any picture I probably already had in mind. I was interested in how families of my generation look like. Therefore the families were not seated by me, they chose to sit how they felt comfortable. During this time, I became aware of all kinds of constellations and circumstances the families live in and how their life is defined by all means of the present time. After he finished his studies of photography at the University of Essen in 1993, he began realizing own projects. He has also been lecturing at the Hochschule für Kunst und Gestaltung in Zurich and currently at the Institute of Design in Düsseldorf. Several of his projects had been shown in exhibitions in many different countries, some are published in books or magazines.